Muddiman Equipment, Vehicle & Contents Auction — Harritt Group, Inc.
Fred & Winnie have sold their 66-acre Greenville farm where they have lived since 1991 and will now sell live onsite their John Deere 5203 diesel tractor, 1993 Ford F150 pickup truck, implements, tools, antiques, collectibles & household furnishings. 1993 Ford F150 pickup, 2WD, long bed, 6 cylinder, automatic, 105K miles. 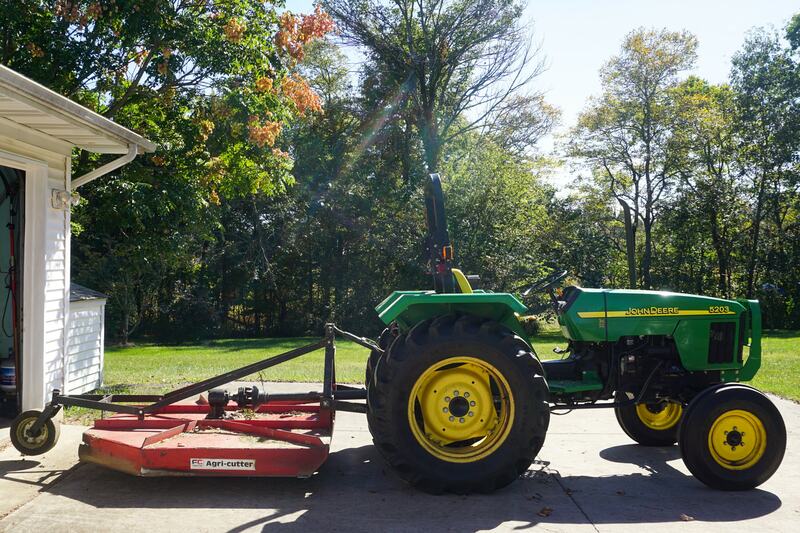 John Deere 5203 diesel tractor w/ 723 hours. Goossen 3-point PTO driven chipper-shredder, Eurospan 3-point fertilizer spreader, Ford 3-point 706 scoop, 3-point box grader w/teeth, grader blade, AGRI cutter rotary mower, TG5000 generator, Campbell-Hausfeld 5 HP compressor, electric power washer, floor jack, Lincoln AC/DC welder, weedeaters, McCullough tree saw, wheel barrow, battery charger, hand, yard & power tools, rough cut lumber, firewood & miscellaneous items from barn. (2) Maple retro twin beds w/bottom drawers, maple comb back rocker, (2) Tell City arrow back chairs, oak mission style rocker, 1930’s vanity w/triple mirror, tan sofa, Cosco step stool, gliding rocker & stool, music stand, end & stand tables, old laboratory table, cedar chest and more. Wm. Putnam pump organ, (4) old student desks from Morgan Township School, (2) milk cans, crocks & jugs, New Queen oak treadle sewing machine, buggy jack lamp, cast iron patio settee w/(2) chairs, McCormick Deering sickle bar sharpener, sausage grinder, ball jars, vintage Pyrex & Corelle Ware, Fostoria cake stand, glassware, dinner bell, sled, spongeware bowl, turkey platter, wood fruit & bowls, LP records, bar items, (2) turntables, old books, travel items, 1971 Miss Madison button, landscape paintings & prints, kitchenware, seasonal decor and more. I-64 to Greenville Hwy. 150 Exit#119. West 8 miles to left on Georgetown Greenville Road. South 1.8 miles to right on Nadorff Road. 8/10 mile to auction on left.